CHICAGO (February 11, 2019) - In its 34th year of honoring the nation's best high school athletes, The Gatorade Company, today announced Keeton Thornsberry of Holy Cross High School as its 2018-19 Gatorade Kentucky Boys Cross Country Runner of the Year. Thornsberry is the second Gatorade Kentucky Boys Cross Country Runner of the Year to be chosen from Holy Cross High School. The award, which recognizes not only outstanding athletic excellence, but also high standards of academic achievement and exemplary character demonstrated on and off the field, distinguishes Thornsberry as Kentucky's best high school boys cross country runner. 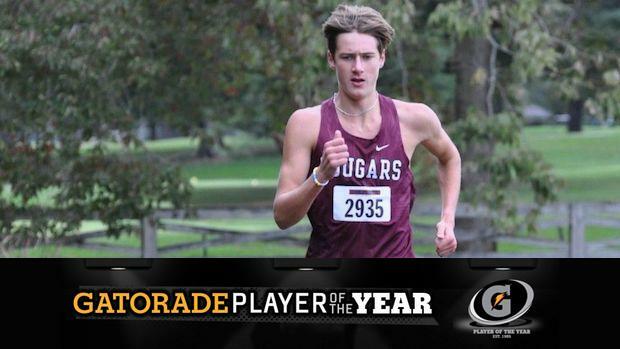 Now a finalist for the prestigious Gatorade National Boys Cross Country Runner of the Year award to be announced in February, Thornsberry joins an elite alumni association of past state award-winners in 12 sports, including Lukas Verzbicas (2010-11, 2009-10 Carl Sandburg, Orland Park High School, Ill.), Donn Cabral (2007-08, Glastonbury High School, Glastonbury, Conn.) and Chris Derrick (2007-08, Neuqua Valley High School, Naperville, Ill.). An intern at a local pediatrician's office, Thornsberry is the president of the Holy Cross High School National Honor Society. He has volunteered locally with a youth ministry and at the St. Joseph Orphanage in Cincinnati. "Keeton is driven, demanding of self and others, confident in his abilities and thorough in his approach to his sport," said Jud Bachler, head coach of Holy Cross High School. "He is the cream of the crop in Kentucky high school cross country." Two-time winner Thornsberry joins Gatorade Kentucky Boys Cross Country Runners of the Year Yared Nuguse (2016-17, duPont Manual High School), Cole Dowdy (2015-16, South Oldham High School), Ethan Shuley (2014-15, Highlands High School), and Patrick Gregory (2013-14, Butler Traditional High School), as athletes who have won the cross country award since its inception in 2007. As a part of Gatorade's cause marketing platform "Play it Forward," Thornsberry has the opportunity to award a $1,000 grant to a local or national youth sports organization of his choosing. He is also eligible to submit an essay to win one of twelve $10,000 spotlight grants for the organization of choice, which will be announced throughout the year.